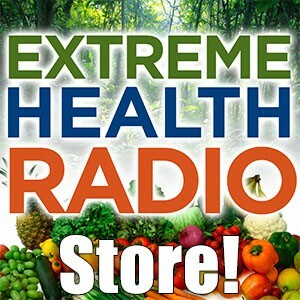 Click play below to hear our lively interview with nutrition researcher Robert von Sarbacher. No more detox side effects from protocols…strength that you FEEL internally, perfect strengthening of the heart, removal of calcifications, cancer fighter bar none… endless testimonials from all corner of the earth on all of this as well as panic attacks ceasing and ADD ADHD disappearing or lessening…NOOOO MORE pain from sore hips or knees… or extreme lessening of either of those… much stronger bones, and eyes and …. Sigh, I’ll be here forever.. see for yourself below after the intro and the directions. DO NOT XRAY EVER – it will kill the electrolytes! This refers to traveling by plane! Not via mail… but if you’re ever worried about the mail… if it has XRAYS – only if sending to a gov’t building or security building or to any foreign country in the world.. then wrap in Aluminum foil or just wrap it just in case!!! Magnesium is purely body building, it may detox you to the extreme but you will NEVERRR know it, b/c it is sooooo building of the body and useful to all the body systems and building materials of the body… people will often use this product for 4 to 8 weeks and then do regular detoxes and have NOOOO detox side effects from them like they did before, no herxheimer reactions!!!! This is powerful stuff not like regular magnesium oils, use the dispenser bottle it comes with so that can apply it and DILUTE IT if needed… though to be fair, most need some dilution depending on the person’s skin, this is the most HEATING MAG OIL I’ve ever seen…. It’s just so freakishly powerful… dilute it if/when necessary. To be applied 2x/day everyyyy day, morning and night AFTER you dry off out of the shower… put some Mag Oil from the dispensing bottle into your hand and apply by just rubbing it on with your hands. Put on Olive oil over any place that itches and face whether it itches or not (if you put any Mag Oil on the face that is)… feel free to skip putting this Mag oil over face if you want, though I always put it on face with Olive oil.. up to you, I do it now 2x/week…now that I’m way past the 4 weeks mark, I put it on face once a week now with olive oil on top or 2x/day…. It’s totally unnecessary for perfect Mag levels in a few weeks though! Shoulders down is more than enough to give 100% perfect bodily Mag levels in 4 weeks without having to put it on face, to make that ultra clear. Ok, built up properly with noooo trouble catching breath this whole time, then don’t need to take it slower, just make sure you do not apply it to your back EXCEPT to the kidney areas, b/c your body needs to BREATH thru the skin, and if cover it all up then there’s a problem…. I personally apply it to my face and neck as well when doing this but ONLY at night do I do that also… b/c to do it in day time would be quite… shiny… up to you… some people like that look….either way use Olive oil on top. If you have extremely large calcifications over the whole body, or in area of hands or whatever, no problem, apply this ACE Mag oil like so: put Tbl ea of ACE Mag Oil and Olive Oil in your hand and rub together ( it will try to go everywhere, try to retain it) and apply to hands or knuckles or anywhere on body with extreme calcifications!…. see what happens to the size of the giant calcified knuckles in about 2 to 3 weeks or 4 weeks… let me know if they are still there? Or normal size yet please… keep applying until normal in size. Lot of people LOVE this for a deodorant but will tell you how to handle it: when taking it as a deodorant you will notice the first 1 to 2 weeks it feels like it’s congested in your armpit in your lymph or whatever in and under and around there… this is normal and after about 2 weeks of use, odor seems to disappear as well as the weird congested lymph system feeling under there as well!! Raul Vergini,MD Back in 1915, a French surgeon, Prof. Pierre Delbet,MD, was looking for a solution to cleanse wounds, because he had found out that the traditional antiseptic solutions actually mortified tissues and facilitated the infection instead of preventing it. He tested several mineral solutions and discovered that a Magnesium Chloride solution was not only harmless for tissues, but it had also a great effect over leucocytic activity and phagocytosis; so it was perfect for external wounds treatment. Dr.Delbet performed a lot of “in vitro” and “in vivo” experiments with this solution and he became aware that it was good not only for external applications, but it was also a powerful immuno-stimulant if taken by injections or even by mouth. He called this effect “cytophilaxis”. In some “in vivo” experiments it was able to increase phagocytosis rate up to 300%. Dr.Delbet serendipitously discovered that this oral solution had also a tonic effect on many people and so became aware that the Magnesium Chloride had an effect on the whole organism. In a brief time, he received communications of very good therapeutics effects of this “therapy” from people that were taking Magnesium Chloride for its tonic properties and who were suffering from various ailments. Prof.Delbet began to closely study the subject and verified that the Magnesium Chloride solution was a very good therapy for a long list of diseases. He obtained very good results in: colitis, angiocholitis and cholecystitis in the digestive apparatus; Parkinson’s Disease, senile tremors and muscular cramps in the nervous system; acne, eczema, psoriasis, warts, itch of various origins and chilblains in the skin. There was a strengthening of hair and nails, a good effect on diseases typical of the aged (impotency, prostatic hypertrophy, cerebral and circulatory troubles), and on diseases of allergic origin (hay-fever, asthma, urticaria and anaphylactic reactions). Then Prof.Delbet began to investigate the relationship between Magnesium and Cancer. After a lot of clinical and experimental studies, he found that Magnesium Chloride had a very good effect on prevention of cancer and that it was able to cure several precancerous conditions: leucoplasia, hyperkeratosis, chronic mastitis, etc. Epidemiological studies confirmed Delbet’s views and demonstrated that the regions with soil more rich in magnesium had less cancer incidence, and vice versa. In experimental studies, the Magnesium Chloride solution was also able to slow down the course of cancer in laboratory animals. Prof. Delbet wrote two books, “Politique Preventive du Cancer” (1944) and “L’Agriculture et la SantÃ©” (1945), in which he stated his ideas about cancer prevention and better living. The first is a well documented report of all his studies on Magnesium Chloride. In 1943 another French doctor, A.Neveu,MD, used the Magnesium Chloride solution in a case of diphteria to reduce the risks of anaphylactic reaction due to the anti-diphteric serum that he was ready to administer. To his great surprise, when the next day the laboratory results confirmed the diagnosis of diphteria, the little girl was completely cured, before he could use the serum. He credited the immuno-stimulant activity to the solution for this result, and he tested it in some other diphteric patients. All the patients were cured in a very short time (24-48 hours), with no after-effects. As Magnesium Chloride has no direct effect on bacteria (i.e.it is not an antibiotic ), Neveu thought that its action was aspecific, immuno-enhancing, so it could be useful, in the same manner, also against viral diseases. So he began to treat some cases of poliomyelitis, and had the same wonderful results. He was very excited and tried to divulge the therapy, but he ran into a wall of hostility and obstructionism from “Official Medicine”. Neither Neveu or Delbet (who was a member of the Academy of Medicine) was able to diffuse Neveu’s extraordinary results. The opposition was total: Professors of Medicine, Medical Peer-Reviews, the Academy itself, all were against the two doctors. “Official Medicine” saw in Magnesium Chloride Therapy a threat to its new and growing business: vaccinations. Dr. Neveu wasn’t discouraged by this and continued to test this therapy in a wide range of diseases. He obtained very good results in: pharyngitis, tonsillitis, hoarseness, common cold, influenza, asthma, bronchitis, broncho-pneumonia, pulmonary emphysema, “children diseases” (whooping-cough, measles, rubella, mumps, scarlet fever…), alimentary and professional poisonings, gastroenteritis, boils, abscesses, erysipelas, whitlow, septic pricks (wounds), puerperal fever and osteomyelitis. But the indications for Magnesium Chloride therapy don’t end here. In more recent years other physicians (and I among these) have verified many of Delbet’s and Neveu’s applications and have tried the therapy in other pathologies: asthmatic acute attack, shock, tetanus (for these the solution is administered by intravenous injection); herpes zoster, acute and chronic conjunctivitis, optic neuritis, rheumatic diseases, many allergic diseases, spring- asthenia and Cronic Fatigue Syndrome (even in cancer it can be an useful adjuvant. The preceding lists of ailments are by no means exhaustive; maybe other illnesses can be treated with this therapy but, as this is a relatively “young” treatment, we are pioneers, and we need the help of all physicians of good will to definitely establish all the true possibilities of this wonderful therapy. From a practical standpoint, please remember that only Magnesium CHLORIDE has this “cytophilactic” activity, and no other magnesium salt; probably it’s a molecular, and not a merely ionic, matter. These doses must be administered BY MOUTH. The only controindication to Magnesium Chloride Therapy is a severe renal insufficiency*. As the magnesium chloride has a mild laxative effect, diarrhea sometimes appears on the first days of therapy, expecially when high dosages (i.e. three doses a day) are taken; but this is not a reason to stop the therapy. The taste of the solution is not very good (it has a bitter-saltish flavor) so a little fruit juice (grapefruit, orange, lemon) can be added to the solution, or it can be even used in the place of water to make the solution itself. Grapefruit juice masks the bitter taste very well (expecially if cold). For CHRONIC diseases the standard treatment is one dose morning and evening for a long period (several months at least, but it can be continued for years. In ACUTE diseases the dose is administered every 6 hours (every 3 hours the first two doses if the case is serious); then space every 8 hours and then 12 hours as improvement goes on. After recovery it’s better going on with a dose every 12 hours for some days. As a PREVENTIVE measure, and as a magnesium supplement, one dose a day can be taken indefinitely. Magnesium Chloride, even if it’s an inorganic salt, is very well absorbed and it’s a very good supplemental magnesium source. For INTRAVENOUS injection, the formula is: Magnesium Chloride hexahydrate………………….25 grams Distilled Water………………………………………….100 cc Make injections of 10-20cc (very slowly, over 10-20 minutes) once or twice a day. Of course the solution must be sterilized. This therapy gives very good results also in Veterinary Medicine, at the appropriate dosages depending upon the size and kind of animals. Raul Vergini, MD Â– Italy Â– author of: “Curarsi con il Magnesio” Red Edizioni -Italy 1994 (book translated in french and spanish but not in english, sorry). According to Raul Vergini, M.D., the 25% solution for IV injections is correct. Personally I never use it, I use only the oral way. But it was used over thirty years ago by some French doctors (5 grams in 20 ml of saline solution of distilled water) to treat tetanus and other less dangerous diseases (asthmatic attacks, choc, opthalmic herpes, herpes zoster, Quincke’s oedema, itching, etc.). It was injected very slowly (in 10-20 minutes), and the results were very good. June 03, 2003 – Chris Gupta Magnesium: Research Misconduct? (http://www.newmediaexplorer.org/chris/2005/10/23/magnesium_research_misconduct.htm) Here is another example of how systematically – the pharmaceuticals manipulate safe and cost effective solutions and put us at risk and all the time extolling their self serving concern for the patient. Just one, of far too many, examples of this sort of thing happening time after time. Its sad to see how the researchers get sucked into these! This is an update that includes links and error corrections…. Transdermal Magnesium is a great way to raise magnesium levels back to optimum for those whose skin absorption is functioning well. (The skin may not absorb the good stuff well if it has previously been exposed to things like mineral oil, which the body cannot use. In this example, the body’s response over time will be to slow down skin ‘permeability & transport’ in order to limit the absorption of a harmful product. The body creates a natural response that repels the mineral oil. The skin then becomes conditioned to repel everything. Trandermal Magnesium will take longer to work in this case and one would need to stop the use of mineral oil based products. “Dr Seeger and Dr Budwig in Germany have shown that cancer is mainly the result of a faulty energy metabolism in the powerhouses of the cells, the mitochondria. ATP and most of the enzymes involved in the production of energy require magnesium. A healthy cell has high magnesium and low calcium levels. The problem that comes with low magnesium levels is the calcium builds up inside the cells while energy production decreases as the mitochondria gradually calcify. “Magnesium is critical for all of the energetics of the cells because it is absolutely required that the magnesium be bound (chelated) by ATP (adenosine triphosphate) , the central high energy compound of the body. ATP without bound magnesium cannot create the energy normally used by specific enzymes to make protein, DNA, RNA, transport sodium or potassium or calcium in and out of cells, nor to phosphorylate proteins in response to hormone signals, etc. In fact, ATP without enough magnesium is non-functional and leads to cell death. “Bound magnesium holds the triphosphate in the correct stereochemical position so it can interact with ATP using enzymes. Magnesium also polarizes the phosphate backbone so that the “backside of the phosphorus” is more positive and susceptible to attack by nucleophilic agents such as hydroxide ions or other negatively charged compounds. “Bottom line, magnesium at critical concentrations is critical to life.” Says Dr Boyd Haley, who also asserts strongly that “All detoxification mechanisms have as the bases of the energy required to remove a toxicant the need for magnesium and ATP to drive the process. There is nothing done in the body that does not use energy and without magnesium this energy can neither be made nor used.” Detoxification of carcinogenic chemical poisons is essential for people who want to avoid the ravages of cancer. The importance of magnesium should not continue being underestimated. “Among other effects, magnesium improves the internal production of defensive substances, such as antibodies and considerably improves the operational effect of white, granulozytic blood cells (shown by Delbert with magnesium chloride), and contributes to many other functions that ensure the integrity of cellular metabolism. “In 1961. Dr Hans A. Nieper, introduced cardiac therapy based on magnesium aspartate. He was surprised to observe that hardly any new cancer occurrences appear in the group of patients so treated. The rate of new cancerous diseases with long-term magnesium therapy was reported to be less than 20% of the frequency otherwise expected. “In an uncontrolled trail, researchers in the UK found that intravenous magnesium relieves neuropathy pain in patients with cancer. (Reuters Health, Feb. 10, 2000 AND the Journal of Pain and Symptom Management. Jan. 2000;19:35-39) . Magnesium acts as a non-competitive antagonist of the N-methyl-D-aspartat e receptor, which has been implicated in the transmission of pain, according to Dr Vincent Crosby and colleagues at Nottingham City Hospital. “It is known that carcinogenisis induces magnesium distribution disturbances, which cause magnesium mobilization through blood cells and magnesium depletion in non-neoplastic tissues. Magnesium deficiency seems to be carcinogenic, and in cases of solid tumours, a high level of magnesium inhibits carcinogenesis. (Durlach J, Bara M, Guiet-Bara A, Collery P, Relationship between magnesium, cancer and carcinogenic or anit-cancer metals. Anticancer Res. 1986 Nov-Dec;6(6) ;1353-61. ) Both carcinogenesis and magnesium deficiency increase the plasma membrane permeability and fluidity. I hope this clarifies the matter a little. Magnesium has been consistently depleted in our soils. It has been further depleted in plants by the use of potassium and phosphorus-laden fertilizers which alter the plant’s ability to uptake magnesium. Water from deep wells supplies additional magnesium not found in food, but surface water, our common source of supply, lacks magnesium. Food processing removes magnesium. Broiling, steaming and boiling remove magnesium into the water or drippings. High carbohydrate and high fat diets increase the need for magnesium as does physical and mental stress. Diuretic medications and insulin further deplete total body magnesium. As we age, magnesium uptake may be impaired. Dieting reduces intake of already low levels of magnesium intake. As you go through this list you will be amazed, as I was, at how many conditions and diseases are clinically tied to magnesium deficiency. Blood tests for magnesium deficiency are irrelevant and unusable. These levels do not reflect total body magnesium (TBM). Magnesium levels of bone and intracellular levels of magnesium are what tell the true status of TBM. Doing your own research on Medline will bring fruitful results. Try a search like ‘magnesium and osteoporosis’ or ‘magnesium and sleep’ or ‘magnesium and anxiety or stress’. Magnesium is a critical element in 325+ biochemical reactions in the human body. Research in France and several other European countries gives a clue concerning the role of magnesium plays in the transmission of hormones (such as insulin, thyroid, estrogen, testosterone, DHEA, etc. ), neurotransmitters (such as dopamine, catecholamines, serotonin, GABA, etc. ), and minerals and mineral electrolytes. This research concludes that it is magnesium status that controls cell membrane potential and through this means controls uptake and release of many hormones, nutrients and neurotransmitters. It is magnesium that controls the fate of potassium and calcium in the body. If magnesium is insufficient, potassium and calcium will be lost in the urine and calcium will be deposited in the soft tissues (kidneys, arteries, joints, brain, etc.) Magnesium protects the cell from aluminum, mercury, lead, cadmium, beryllium and nickel. Most of our members are familiar with Dr. Carolyn Dean, author of The Magnesium Miracle, among other books. 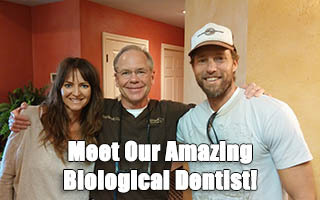 She is also the doctor interviewed on our free Magnesium CD. Magnesium . . . I love your Magnesium Oil! It was recommended to me by my Aunt JoAnne, known as the Herb Lady in Mineral Wells, Texas. I have had problems with my feet for years, mostly the right foot. Recently I was diagnosed with Plantar Fasciitis and told it would take months to heal and to walk as little as possible. This was hard, because walking is my main form of exercise, I usually walk my dog for an hour every day. I started using the Magnesium Oil on my right foot, and the pain and inflammation went away within a week. I could go on my regular walks again! Then I tripped over my dog and sprained my left foot. So I put Magnesium Oil on both feet. The pain in my newly sprained left foot went away the next day. It was amazing. Now I rub Magnesium Oil onto both my feet before bed. No pain, and I can keep up my walking. My dog and I both thank you! This is a wonderful natural remedy that works, and I never had to take any of the pills prescribed by my doctor. Magnesium Boosts Energy, Benefits Athletes . il v57, Better Nutrition for Today’s Living, July 1995, p28(1). Gabe Mirkin, M.D., a nutrition expert and runner, and coauthor of the Sportsmedicine Book, reported that exercisers who feel weak and tired may be suffering from “the mineral blues,” which is characterized as a deficiency of potassium and magnesium inside muscle cells, according to The Complete Book of Vitamins and Minerals for Health. “A loss of magnesium through sweat can bring fatigue and muscle cramps because of the role the mineral plays in controlling muscle contraction and regulating the conversion of carbohydrates to energy,” the publication stated. In foods, potassium and magnesium can be found in nuts, soybeans, whole grains, fruits and vegetables. Athletes, body builders, runners and those who perform strenuous exercise or physical work are advised to make sure their cellular magnesium levels are up to par, reported Eberhard Kronhausen, Ed.D., et al., in Formula for Life: The Antioxidant, Free-Radical Detoxification Program. “Magnesium is responsible–together with calcium–for the production of adenosine triphosphate (ATP), our most important high-energy phosphate compound,” the authors added. “In addition, good magnesium levels are needed for optimal muscle contraction and to sustain the high oxygen consumption necessary for athletic performance. Research indicates that magnesium facilitates oxygen delivery to working muscle tissue…” In addition to its contribution to multiple enzyme systems, including ATP metabolism in the production of energy, magnesium plays a role in protecting us against ischemic heart disease, myocardial infarction, cardiac arrhythmias, high blood pressure, asthma, preeclampsia and alcohol withdrawal, according to Robert M. McLean, M.D., of the Yale School of Medicine in New Haven, Conn., in the January 1994 issue of The American Journal of Medicine. He went on to say that the amount of magnesium in the blood does not necessarily correlate with the amount of the mineral stored in the body, making a magnesium deficiency difficult to pinpoint. Low magnesium levels are rather common problems found in about 65 percent of intensive care patients and about 11 percent of the general patient population, he said. Magnesium levels can be depleted by such drugs as amphotericin B, cyclosporine, cisplatin, digojcin, ethanol, gentamicin, loop diuretics and pentamidine, he added. A combination of magnesium and malic acid (extracted from apples and other foods) has been useful in treating some patients with chronic fatigue syndrome, reported the Spring 1993 issue of Health Watch, a publication of the Chronic Fatigue Syndrome Research Foundation in Santa Barbara, Calif. Daniel Peterson, M.D., said that the combination of the mineral and malic acid benefits up to 40 percent of the patients with chronic fatigue syndrome. Malic acid should be included in the therapy for these patients, added Jay Goldstein, M.D. The researchers indicate that fibromyalgia (associated with muscle and bone aches, pins-and-needles feelings, fatigue, tension headaches, insomnia, etc.) may not respond to the magnesium-malic supplement for 48 hours. For chronic fatigue syndrome, this therapy may take two weeks, they said. In addition to contributing to ATP production, malic acid is important in the Krebs cycle, in which fats and sugar are converted into energy, the researchers continued. The therapeutic dose that they recommend for patients is six to 12 tablets/day of malic acid and magnesium hydroxide. The supplement is to be taken with food and water. “Those who exercise strenuously need magnesium because it helps deliver oxygen to the muscles for peak performance,” according to Rita Aero and Stephanie Rick in Vitamin Power. Magnesium is vital for converting glycogen into glucose for use as the body’s fuel.” Health food stores carry a variety of magnesium supplements, and some stores may have the magnesium malate supplement. REFERENCES Aero, Rita, and Rick, Stephanie. Vitamin Power. New York: Harmony Books, 1987, p. 159. “A Follow-up on Malic Acid: CFIDS Buyers Club,” Health Watch 3(1):1,3, Spring 1993. The Complete Book of Vitamins and Minerals for Health, Emmaus, Pa.: Rodale Pres, 1988, p. 450. Kronhausen, Eberhard, Ed.D., et al. Formula for Life: The Antioxidant, Free-Radical, Detoxification Program. New York: William Morrow Co., Inc., 1989, p. 168. McLean, Robert M., M.D. “Magnesium and Its Therapeutic Uses: A Review”, The American Journal of Medcine 96:63-76, January 1994. Just wanted to tell you what a wonderful product the transdermal Magnesium has been for me. I was recently hospitalized in ICU for fluid buildup in my lungs (due to chemo toxicity) that resulted in congestive heart failure. I put on 20 pounds of fluid and the diuretics took off only 10 of that by the time I was discharged. I had about 5 pounds of fluid in my lungs which they tapped, and the other 5 pounds I lost in the hospital. So I came home 10 pounds heavier. The diuretics took off about 1 or maybe 2 pounds per day. On my second night home I had my partner rub the magnesium oil on my back and sides where there was fluid “puffiness” and the next morning I lost a whopping 5 pounds of fluid all at once. I returned to normal weight very quickly with the help of the oil. The next few nights after that I rubbed it on my arm which has had lymphedema for a year, and the next morning my arm would have less fluid in it. It is almost normal size now, from being about twice as big as normal. I consider the magnesium oil to be a miracle and highly recommend this safe and natural product to everyone. I gave some to my mother to use on her swollen arthritic knee and it helped reduce swelling and pain, and it did the same for a friend’s arthritic hand as well. So this oil is indeed a special gift. Thanks so much for sending it to me! Magnesium Chloride In Acute And Chronic Diseases – Share The Wealth http://www.newmediaexplorer.org/chris/2005/09/15/magnesium_chlorid… 1 of 5 25/10/2005 16:24 Share The Wealth by Chris Gupta Self-Sufficiency Is The Key To Empowerment And Freedom September 15, 2005 Magnesium Chloride In Acute And Chronic Diseases Categories Control tactics (http://www.newmediaexplorer.org/chris/control_tactics.htm) Health through Nutrition (http://www.newmediaexplorer.org/chris/health_through_nutrition.htm) Practical Health (http://www.newmediaexplorer.org/chris/practical_health.htm) …”The opposition was total: Professors of Medicine, Medical Peer-Reviews, the Academy itself, all were against the two doctors. “Official Medicine” saw in Magnesium Chloride Therapy a threat to its new and growing business: vaccinations.”… See also: Magnesium: Research Misconduct? (http://www.newmediaexplorer.org/chris/2003/06/02/magnesium_research_misconduct.htm) Here is another under used mineral. Like Vitamin C (http://www.newmediaexplorer.org/chris/2005/09/14/the_stonewalling_of_vitamin_c.htm) , it to is nearly miraculous for the depth and scope of it’s application. The comparison between to two is uncanny imagine what they could do combined? Both these supplements were (and are) able to cure polio but ran up against the vaccine racket. Some other benefits are: …”Many of the symptoms of Parkinson’s disease can be overcome with high magnesium supplementation…. …In a trial with 30 epileptics 450 mg of magnesium supplied daily successfully controlled seizures. Another study found that the lower the magnesium blood levels the more severe was the epilepsy. In most cases magnesium works best in combination with vitamin B6 and zinc… ….Countries with the highest calcium to magnesium ratios (high calcium and low magnesium levels) in soil and water have the highest incidence of cardiovascular disease. At the top of the list is Australia…. See also: Orthomolecular Solutions to Heart Disease (http://www.newmediaexplorer.org/chris/2003/06/03/orthomolecular_solutions_to_heart_disease.htm) …In an American study the death rate due to diabetes was four times higher in areas with low magnesium water levels as compared to areas with high levels of magnesium in the water…. …In a New Zealand study it was found that caries-resistant teeth had on average twice the amount of magnesium as caries-prone teeth…. ….Many studies have shown an increased cancer rate in regions with low magnesium levels in soil and drinking water. In Egypt the cancer rate was only about 10% of that in Europe and America. In the rural fellah it was practically non-existent. The main difference was an extremely high magnesium intake of 2.5 to 3 g in these cancer-free populations, ten times more than in most western countries. See also: Magnesium Chloride – Effective In Treating Urinary Troubles Of Prostate (http://www.newmediaexplorer.org/chris/2005/09/21/magnesium_chloride_effective_in_treating_urinary_troubles_of_prostate.htm) Recent Research Shows Intravenous C Can be Effective Against Some Cancers (http://www.orthomed.com/cancer.htm) () Why Magnesium Chloride? ….”both magnesium as well as chloride have other important functions in keeping us young and healthy. Chloride, of course, is required to produce a large quantity of gastric acid each day and is also needed to stimulate starch-digesting enzymes. Magnesium is the mineral of rejuvenation and prevents the calcification of our organs and tissues that is characteristic of the old-age related degeneration of our body. Using other magnesium salts is less advantageous because these have to be converted into chlorides in the body anyway. We may use magnesium as oxide or carbonate but then we need to produce additional hydrochloric acid to absorb them. Many aging individuals, especially with chronic diseases who desperately need more magnesium cannot produce sufficient hydrochloric acid and then cannot absorb the oxide or carbonate. Epsom salt is magnesium sulphate. It is soluble but not well absorbed and acts mainly as a laxative. Chelated magnesium is well absorbed but much more expensive and lacks the beneficial contribution of the chloride ions. Orotates are good but very expensive for the amount of magnesium that they provide and both orotates and chelates seem to lack the infection-fighting potential of the magnesium chloride.”…. Magnesium Chloride In Acute And Chronic Diseases – Share The Wealth http://www.newmediaexplorer.org/chris/2005/09/15/magnesium_chlorid… 2 of 5 25/10/2005 16:24 See Walter Last’s MAGNESIUM CHLORIDE for Health & Rejuvenation (http://users.mrbean.net.au/~wlast/magnesiumchloride.html) for much expanded review of this miracle mineral. Unfortunately, a more detailed book, on how to exploit magnesiumÂ’s properties to prevent and treat various condition, CURARSI CON IL MAGNESIO (http://www.red-edizioni.it/schedalibro.html?code=88-7447-051-7) (HOW TO CURE WITH MAGNESIUM) by R. Vergini is only available in Italian, French and Spanish. If there is a reader who should like to translate this in English they can go to the foreign translations and rights page here (http://www.red-edizioni.it/foreign.html) with email address of the woman managing them. Chris Gupta ———————— . The Miracle of Magnesium Subscribe to Dr. Hotze’s Newsletter Bottom of Form THE MIRACLE OF MAGNESIUM Every day I hear another magnesium success story. My editor for the UK edition of The Miracle of Magnesium told me that as soon as she read my manuscript she gave magnesium to a friend who had severe muscle cramps. Her friend had visited several doctors and nobody could diagnosis her condition or offer her relief. Magnesium helped her immediately. My book agent’s brother can’t believe how much his energy has improved on magnesium and his wife’s menopausal symptoms are lifting since she began taking supplements. And every day I also hear distressing stories about magnesium deficiency. Just today walking along the beach near my home I met an 80-year old gentleman who asked me to sit and talk. Julius said he used to walk up and down the beach like me but now his arthritis prevented him. But he said he only began having symptoms of arthritis after taking medication for slightly elevated cholesterol. Instead of a diet and magnesium, his doctor immediately put him on a cholesterol-lowering drug. When he began developing pain, which was obviously from the drug, instead of stopping the drug and giving magnesium to lower cholesterol, to help detoxify the drug, and also lessen muscle cramps, his doctor gave him a strong pain medication. And then his ankles began to swell and Julius said his doctor gave him a diuretic! And so the story goes, one drug causing symptoms that demand another drug. That’s what doctors learn about in medical school: drugs. They don’t learn about diet and nutrients, so it seems that all they know how to do is prescribe drugs. Julius said he was going to tell his doctor to change his cholesterol medication, which, by the way, in several years had only dropped his cholesterol of 205 to 185. I told him to go on a cholesterol-lowering diet and take magnesium. Even though Julius said he was mad about having to take the drugs and he wished he had been given a diet in the first place, Julius said he would have to ask his doctor before taking the magnesium. And my heart sank, because his doctor probably didn’t learn about magnesium supplementation in medical school and would probably say it’s unnecessary. Doctors know potassium deficiency is a danger for people on diuretics but they don’t acknowledge that magnesium is also flushed out in equal measure. Magnesium deficiency goes undiagnosed and unrecognized because until recently there was no accurate blood test for magnesium*. Patients are warned to take potassium supplements or eat oranges and bananas, but no advice is given about magnesium. Magnesium is not as readily available as potassium; it’s deficient in the soil and most fertilizers don’t contain magnesium, so most foods are lacking. Also cooking and processing foods depletes magnesium. It’s found in whole grains, greens, nuts and seeds, but most people don’t eat much, if any, of those foods. And yet, for some reason doctors think that we get all our nutrients in our very SAD, Standard American Diet and they don’t recognize the need for nutrient supplementation. It all stems back to a medical education that is funded by drug companies that have no vested interest in promoting nutrients. Vitamins and minerals can’t be patented and are relatively inexpensive. My research for The Miracle of Magnesium reminded me that all the metabolic processes in the body, ALL OF THEM, depend on vitamins and minerals, which act as necessary co-factors. Magnesium itself is a co-factor and responsible for the function of 325 enzymes; is an absolute requirement for calcium to be incorporated into bone; keeps toxic chemicals out of the brain; dances with calcium to create nerve impulses and muscle impulses; keeps muscles relaxed, including the heart and blood vessels, and triggers dozens of health conditions if it is deficient. The Recommended Daily Allowance (RDA) for magnesium is between 350 and 400 milligrams per day, which is just enough to ward off outright deficiency. But for optimal health and for the twenty-two conditions that are triggered by magnesium deficiency, perhaps twice as much magnesium is needed. One of the highest sources of magnesium is kelp, but one tsp. only has about 30 milligrams. One tablespoon of almonds has 33 milligrams. Because we probably don’t get nearly enough magnesium from out diet we have to investigate magnesium supplements. I use several types of magnesium. However, I stopped using magnesium oxide in 2005 when I read a study that showed only 4 percent of the oxide form of magnesium is absorbed. That’s why magnesium oxide is a great laxative but if you want to stock up on magnesium you need to use other forms. 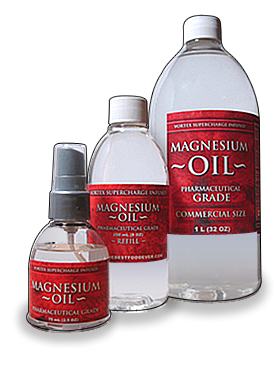 I use magnesium citrate and magnesium taurate and also spray on magnesium oil after a shower. Magnesium oil is supersaturated magnesium chloride and because it’s used topically it doesn’t cause a laxative effect. And I find it really does work. I seem to have a very high requirement for magnesium and to get enough by mouth I can have a laxative reaction—but if I use magnesium oil, I only need to take half the amount of magnesium by mouth and therefore avoid loose stools. You also have read labels when you buy magnesium products. For example a label may say magnesium taurate, or magnesium citrate, or magnesium glycinate, 500 milligrams, but when you look at the fine print on the back of the bottle you will notice the actual amount of magnesium is much less. The actual amount of magnesium in 500 mg of magnesium glycinate is 50 mg. Companies that make chelated minerals like magnesium glycinate and magnesium taurate claim that chelates are more readily absorbed. That may be the case, but how you tell is if they have less of a laxative effect. The best way to tell if you are getting enough magnesium is the “bowel test”. You know when you have too much magnesium when your stools become loose. This, in fact, may be a blessing for people with constipation and is one of the many ways magnesium deficiency manifests. But, if you are like me and still get a Charlie horse or a heart palpitation when you don’t have enough magnesium, then reach for the magnesium oil. The only contraindications to magnesium are caused in people with outright kidney failure, bowel obstruction, Myasthenia gravis, or heart block. Also, if you have a heart condition you may find that taking magnesium can lessen the need for heart medication and you should be under doctor’s supervision to guide this process. The following 22 medical areas that magnesium deficiency triggers or causes have all been scientifically proven. However, since the publication of The Miracle of Magnesium, people have sent me magnesium stories that go beyond the following list. I’ve been told that magnesium had caused skin to become smooth, gums to heal, and improvements in sexual response. If you are only able to take one supplement–make sure it’s magnesuim! Magnesium deficiency triggers or causes the following conditions: Anxiety and Panic attacks- Magnesium (Mg) normally keeps adrenal stress hormones under control. Asthma- Both histamine production and bronchial spasms increase with Mg deficiency. Blood clots- Mg has an important role to play in preventing blood clots and keeping the blood thin-much like aspirin but without the side effects. Bowel disease- Mg deficiency slows down the bowel causing constipation, which could lead to toxicity and malabsorption of nutrients, as well as colitis. Cystitis- Bladder spasms are worsened by Mg deficiency. Depression-Serotonin, which elevates moods, is dependent on Mg. A Mg-deficient brain is also more susceptible to allergens, foreign substances that can cause symptoms similar to mental illness. Detoxification- Mg is crucial for the removal of toxic substances and heavy metals such as aluminum and lead. Diabetes- Mg enhances insulin secretion, facilitating sugar metabolism. Without Mg insulin is not able to transfer glucose into cells. Glucose and insulin build up in the blood causing various types of tissue damage. Fatigue- Mg-deficient patients commonly experience fatigue because dozens of enzyme systems are under-functioning. An early symptom of Mg deficiency is frequently fatigue. Heart disease- Mg deficiency is common in people with heart disease. Mg is administered in hospitals for acute myocardial infarction and cardiac arrhythmia. Like any other muscle, the heart muscle requires Mg. Mg is also used to treat angina, or chest pain. Hypertension- With insufficient Mg, spasm of blood vessels and high cholesterol occur, both of which lead to blood pressure problems. Hypoglycemia- Mg keeps insulin under control; without Mg episodes of low blood sugar can result. Insomnia- Sleep-regulating melatonin production is disturbed without sufficient Mg. Kidney Disease- Mg deficiency contributes to atherosclerotic kidney failure. Mg deficiency creates abnormal lipid levels and worsening blood sugar control in kidney transplant patients. Liver Disease leading to liver failure- Mg deficiency commonly occurs during liver transplantation. Migraine- Serotonin balance is Mg-dependent. Deficiency of serotonin can result in migraine headaches and depression. Musculoskeletal conditions- Fibrositis, fibromyalgia, muscle spasms, eye twitches, cramps and chronic neck and back pain may be caused by Mg deficiency and can be relieved with Mg supplements. Nerve problems- Mg alleviates peripheral nerve disturbances throughout the whole body, such as migraines, muscle contractions, gastrointestinal spasms, and calf, foot and toe cramps. It is also used in treating central nervous symptoms of vertigo and confusion. Obstetrics and Gynecology- Mg prevents Premenstrual Syndrome; prevents dysmenorrhea (cramping pain during menses); is important in the treatment of infertility; and alleviates premature contractions, preeclampsia, and eclampsia in pregnancy. Intravenous Mg is given in obstetrical wards for pregnancy-induced hypertension and to lessen the risk of cerebral palsy and Sudden Infant Death Syndrome (SIDS). Mg should be a required supplement for pregnant mothers. Osteoporosis- Use of calcium with Vitamin D to enhance calcium absorption without a balancing amount of Mg causes further Mg deficiency, which triggers a cascade of events leading to bone loss. Raynaud’s Syndrome- Mg helps relax the spastic blood vessels that cause pain and numbness of the fingers. Tooth decay- Mg deficiency causes an unhealthy balance of phosphorus and calcium in saliva, which damages teeth. Material excerpted from Dean, Carolyn. The Miracle of Magnesium (2003 Ballantine Books: New York, NY), 2003. pp. 5-7. A test for cellular magnesium called EXATEST is available at www.exatest.com. This updated article was originally printed in Total Health Magazine November, 2003. Dr. Carolyn Dean is an acknowledged authority in both conventional and alternative medicine. As the well-known author of The Miracle of Magnesium, she is an expert in recognizing and treating the dozens of conditions caused by magnesium deficiency. Dr. Dean currently offers private telephone wellness consultations through her website at www.carolyndean.com. Dr. Dean is also an authority in the treatment of bowel disease, hormone imbalance, and yeast overgrowth as evidenced by the 2005 publication of three of her ten books, IBS for DUMMIES, Hormone Balance: A Woman’s Guide to Restoring Health and Vitality, and The Yeast Connection and Women’s Health. Dr. Dean is the medical advisor to yeastconnection.com. She has researched and treated this condition for three decades. You can reach Dr. Dean for wellness consultations on all types of health concerns or autographed copies of her books through her website www.carolyndean.com or by emailing drdean@carolyndean.com. This entry was posted on Tuesday, June 20th, 2006 at 8:48 pm and is filed under Dr. Carolyn Dean. You can follow any responses to this entry through the RSS 2.0 feed. You can leave a response, or trackback from your own site. Raul Vergini,MD Back in 1915, a French surgeon, Prof. Pierre Delbet,MD, was looking for a solution to cleanse wounds, because he had found out that the traditional antiseptic solutions actually mortified tissues and facilitated the infection instead of preventing it. He tested several mineral solutions and discovered that a Magnesium Chloride solution was not only harmless for tissues, but it had also a great effect over leucocytic activity and phagocytosis; so it was perfect for external wounds treatment. Dr.Delbet performed a lot of “in vitro” and “in vivo” experiments with this solution and he became aware that it was good not only for external applications, but it was also a powerful immuno-stimulant if taken by injections or even by mouth. He called this effect “cytophilaxis”. In some “in vivo” experiments it was able to increase phagocytosis rate up to 300%. Dr.Delbet serendipitously discovered that this oral solution had also a tonic effect on many people and so became aware that the Magnesium Chloride had an effect on the whole organism. In a brief time, he received communications of very good therapeutics effects of this “therapy” from people that were taking Magnesium Chloride for its tonic properties and who were suffering from various ailments. Prof.Delbet began to closely study the subject and verified that the Magnesium Chloride solution was a very good therapy for a long list of diseases. He obtained very good results in: colitis, angiocholitis and cholecystitis in the digestive apparatus; Parkinson’s Disease, senile tremors and muscular cramps in the nervous system; acne, eczema, psoriasis, warts, itch of various origins and chilblains in the skin. There was a strengthening of hair and nails, a good effect on diseases typical of the aged (impotency, prostatic hypertrophy, cerebral and circulatory troubles), and on diseases of allergic origin (hay-fever, asthma, urticaria and anaphylactic reactions). Then Prof.Delbet began to investigate the relationship between Magnesium and Cancer. After a lot of clinical and experimental studies, he found that Magnesium Chloride had a very good effect on prevention of cancer and that it was able to cure several precancerous conditions: leucoplasia, hyperkeratosis, chronic mastitis, etc. Epidemiological studies confirmed Delbet’s views and demonstrated that the regions with soil more rich in magnesium had less cancer incidence, and vice versa. In experimental studies, the Magnesium Chloride solution was also able to slow down the course of cancer in laboratory animals. Prof. Delbet wrote two books, “Politique Preventive du Cancer” (1944) and “L’Agriculture et la SantÃ©” (1945), in which he stated his ideas about cancer prevention and better living. The first is a well documented report of all his studies on Magnesium Chloride. In 1943 another French doctor, A.Neveu,MD, used the Magnesium Chloride solution in a case of diphteria to reduce the risks of anaphylactic reaction due to the anti-diphteric serum that he was ready to administer. To his great surprise, when the next day the laboratory results confirmed the diagnosis of diphteria, the little girl was completely cured, before he could use the serum. He credited the immuno-stimulant activity to the solution for this result, and he tested it in some other diphteric patients. All the patients were cured in a very short time (24-48 hours), with no after-effects. As Magnesium Chloride has no direct effect on bacteria (i.e.it is not an antibiotic ), Neveu thought that its action was aspecific, immuno-enhancing, so it could be useful, in the same manner, also against viral diseases. So he began to treat some cases of poliomyelitis, and had the same wonderful results. He was very excited and tried to divulge the therapy, but he ran into a wall of hostility and obstructionism from “Official Medicine”. Neither Neveu or Delbet (who was a member of the Academy of Medicine) was able to diffuse Neveu’s extraordinary results. The opposition was total: Professors of Medicine, Medical Peer-Reviews, the Academy itself, all were against the two doctors. “Official Medicine” saw in Magnesium Chloride Therapy a threat to its new and growing business: vaccinations. Dr. Neveu wasn’t discouraged by this and continued to test this therapy in a wide range of diseases. He obtained very good results in: pharyngitis, tonsillitis, hoarseness, common cold, influenza, asthma, bronchitis, broncho-pneumonia, pulmonary emphysema, “children diseases” (whooping-cough, measles, rubella, mumps, scarlet fever…), alimentary and professional poisonings, gastroenteritis, boils, abscesses, erysipelas, whitlow, septic pricks (wounds), puerperal fever and osteomyelitis. But the indications for Magnesium Chloride therapy don’t end here. In more recent years other physicians (and I among these) have verified many of Delbet’s and Neveu’s applications and have tried the therapy in other pathologies: asthmatic acute attack, shock, tetanus (for these the solution is administered by intravenous injection); herpes zoster, acute and chronic conjunctivitis, optic neuritis, rheumatic diseases, many allergic diseases, spring- asthenia and Cronic Fatigue Syndrome (even in cancer it can be an useful adjuvant. The preceding lists of ailments are by no means exhaustive; maybe other illnesses can be treated with this therapy but, as this is a relatively “young” treatment, we are pioneers, and we need the help of all physicians of good will to definitely establish all the true possibilities of this wonderful therapy. From a practical standpoint, please remember that only Magnesium CHLORIDE has this “cytophilactic” activity, and no other magnesium salt; probably it’s a molecular, and not a merely ionic, matter. The solution to be used is a 2.5% Magnesium Chloride hexahydrate (MgCl2-6H2O) solution (i.e. : 25 grams/1 liter of water). Dosages are as follows: – Adults and children over 5 years old………………125 cc – 4 year old children…………………………………….100 cc – 3 year old children…………………………………….80 cc – 1-2 year old children………………………………….60 cc – over 6 months old children…………………………. 30 cc – under 6 months old children…………………………15 cc These doses must be administered BY MOUTH. The only controindication to Magnesium Chloride Therapy is a severe renal insufficiency*. As the magnesium chloride has a mild laxative effect, diarrhea sometimes appears on the first days of therapy, expecially when high dosages (i.e. three doses a day) are taken; but this is not a reason to stop the therapy. The taste of the solution is not very good (it has a bitter-saltish flavor) so a little fruit juice (grapefruit, orange, lemon) can be added to the solution, or it can be even used in the place of water to make the solution itself. Grapefruit juice masks the bitter taste very well (expecially if cold). For CHRONIC diseases the standard treatment is one dose morning and evening for a long period (several months at least, but it can be continued for years. In ACUTE diseases the dose is administered every 6 hours (every 3 hours the first two doses if the case is serious); then space every 8 hours and then 12 hours as improvement goes on. After recovery it’s better going on with a dose every 12 hours for some days. As a PREVENTIVE measure, and as a magnesium supplement, one dose a day can be taken indefinitely. Magnesium Chloride, even if it’s an inorganic salt, is very well absorbed and it’s a very good supplemental magnesium source. For INTRAVENOUS injection, the formula is: Magnesium Chloride hexahydrate………………….25 grams Distilled Water………………………………………….100 cc Make injections of 10-20cc (very slowly, over 10-20 minutes) once or twice a day. Of course the solution must be sterilized. This therapy gives very good results also in Veterinary Medicine, at the appropriate dosages depending upon the size and kind of animals. ———- Raul Vergini, MD Â– Italy Â– author of: “Curarsi con il Magnesio” Red Edizioni -Italy 1994 (book translated in french and spanish but not in english, sorry). *Dr. Raul Vergini says, that “this is true only for severe renal insufficiency,” where an obvious contraindication may exist; but this is also true for all minerals, that cannot be easily eliminated by a seriously impaired kidney. In all other cases, there are no risks. I never heard or read of any problem. The quantity of elemental magnesium contained in a 125 cc dose of the 2.5% solution is around 500 mg. That is not a large dose! Anyway, I think that it is a good precaution to advise people with problems to consult their physician.” Addendum: According to Raul Vergini, M.D., the 25% solution for IV injections is correct. Personally I never use it, I use only the oral way. But it was used over thirty years ago by some French doctors (5 grams in 20 ml of saline solution of distilled water) to treat tetanus and other less dangerous diseases (asthmatic attacks, choc, opthalmic herpes, herpes zoster, Quincke’s oedema, itching, etc.). It was injected very slowly (in 10-20 minutes), and the results were very good. “Moreover also the Myers’ cocktail contains 2-5 ml of a 20% solution of magnesium chloride (along with other products that may contribute to make the solution more diluted). However, I think that if there are problems of ‘burning’ with the 25% concentration, it should be possible to use, with the same results, a 2.5% solution (the same used by mouth) by dissolving 5 grams of magnesium chloride in 200 ml of distilled water. The solution must be sterilized. “The intramuscular way is not used because the solution is painful.” [In the United States, Magnesium Chloride hexahydrate can be purchased chemically pure (c.p.) 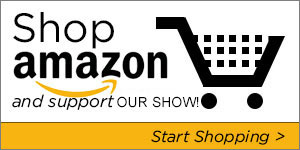 from most chemical supply houses without a prescription: Ed.] A similar pdf copy is here. Robert von Sarbacher, has been a relentless health researcher from the time he was a child. He’s based out of Texas and consults with people all over the world. He developed the Mini Beet Protocol and the Super Hydration Drink which are designed for massive detoxification as well as building the body in specific unique ways. Listen to our latest interview with him!